If you look at the map, you can see certain words that are similar and clumped together. 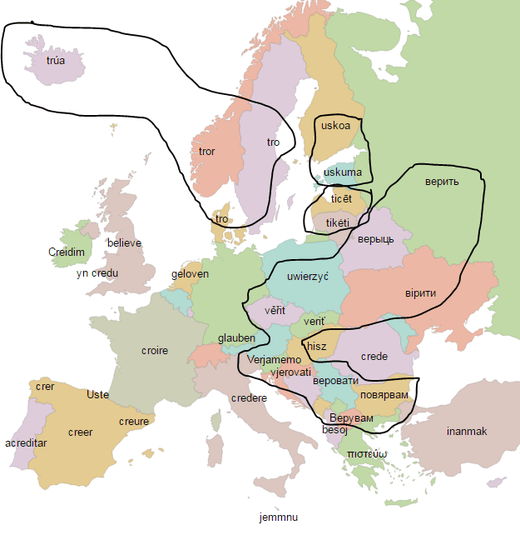 The Slavic languages have something like “vera” (in the Cyrillic alphabet, “вера”). 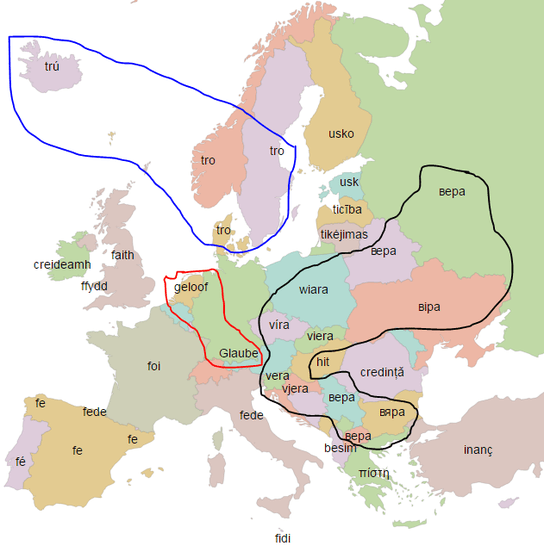 Icelandic, Norwegian, Swedish, and Danish are all from the North Germanic branch, so they are all similar, whereas German and Dutch are from the West Germanic branch, so they look like each other. ​With the verb, “believe,” all of the Romance languages are related to the Latin verb, “credo.” Interestingly, Maltese has “jemmnu.” Maltese is Semitic language like Hebrew, so maybe it is a distant relative to the word, ‘âman (אמן)? Maltese is actually closer to Arabic, but I couldn’t find a close cognate there. 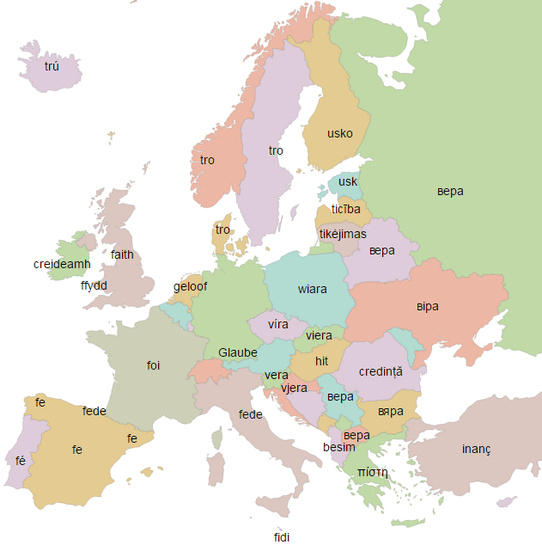 Basque is a language isolate, so I don’t know if anyone really knows where the word, “uste,” came from. Irish, Welsh, and English are really interesting. 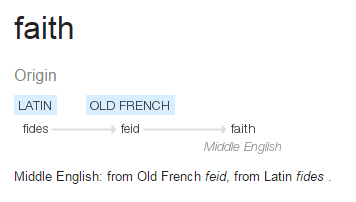 Irish maintains the same Latin verb root to get “creidim” and Welsh uses the same root to get “yn credo.” But, English uses the verb, “believe,” which is completely detached from Latin. 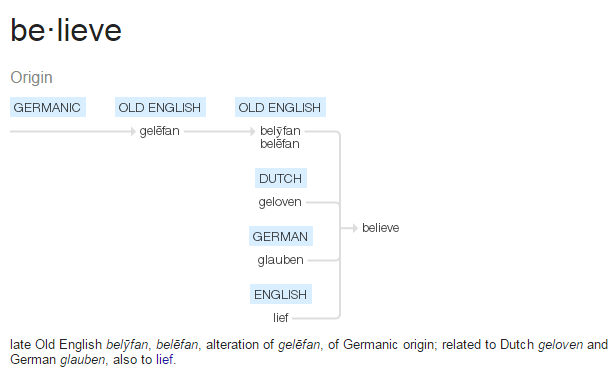 It actually comes from an old Germanic root, which actually makes “believe” more like the German word “glauben” and the Danish word, “geloven.” The B and V sounds are similar, and they all have an l-b/v thing happening in them. ​English is a real oddball here. A noun comes from a Latin root, while the verb comes from a Germanic root. In Greek, the word for “faith” is “pistis” (πίστις) and the word for “believe” is “pisteuō” (πιστεύω). They are the same exact words, but with different endings to denote whether it is a noun or a verb. There’s no connotation of ‘faith’ being intellectual and ‘believe’ being intellectual but with certain deeds, too. In Greek, “faith” and “believe” mean the same things that they mean in English… “faith” and “believe.” This may sound like a no-brainer, but it really is something that has thrown a lot of people off.